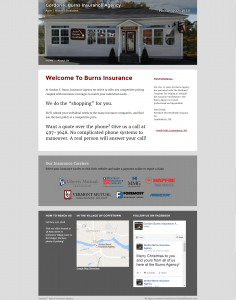 Burns Insurance has been my insurance agency for years. So I was thrilled when they asked me to build them a new website. This new site is built using WordPress and a customized version of the “Twenty Sixteen” template. I also made artwork for the header using a photo they took of the office and some artistic Photoshop filters. WordPress Jetpack has a new widget to connecting to your Facebook page feed. Ive use several other Facebook widgets, but Jetpack’s Facebook Page Plugin is the best I’ve used so far.